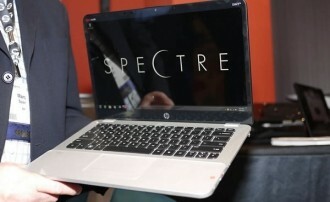 HP has started taking pre-orders for their Envy 14 Spectre Ultrabook that debuted last month at the Consumer Electronics Show in Las Vegas. Starting at $1,399, the Spectre won a Best of CES 2012 award from CNET and was one of the most unique Ultrabook designs of the show. The Envy 14 Spectre is highlighted by Corning Gorilla Glass on the outer lid, screen and palm rest that not only protects against scratches but also acts as a barrier against heat transfer. As we noted during our brief time with the Spectre at CES, HP reduced the size of the bezel in order to fit the larger 14” screen into a smaller than normal space. Termed an “Infinity” display, this method gives the illusion of less wasted space and an even larger display. Another feature that is sure to get people excited is the return of HP’s Radiance Display operating at a resolution of 1600 x 900. HP offered the Radiance Display on earlier models but it had since been discontinued simply because the company wasn’t able to acquire the requisite number of panels to support it. The base model on HP’s website ships with an Intel Core i5-2467M, a 128GB solid state drive, 4GB of DDR3 memory, Intel HD graphics 3000 and up to 9.5 hours of battery life on a single charge. Upgrades are available for some components including up to a Core i7 processor and 256GB of SSD storage. Orders are scheduled to ship on February 17.